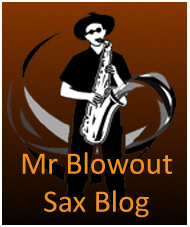 Whilst visiting Blowout Sax one day I noticed Mark Archers book on Adolphe Sax located under the alto saxophones on the bookshelf. It was a fascinating read with some great illustrations, a great story about a man who invented- in my opinion- one of the most beautiful musical instruments ever. It details his struggles in life and his achievements on what was a long and winding road. Definitely worth a read. 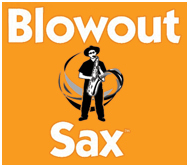 On another trip to the Palace of Pleasure otherwise known as Blowout Sax Mark drew my attention to a newspaper clipping about an exhibition in Brussels celebrating 200 years of Adolphe Sax. It must have been a good read because I kept struggling to read it even having forgotten my glasses. What a great exhibition I thought such a shame it is in Belgium. When would I ever go to Belgium? Then another leaflet appeared about Dinant in Belgium birthplace of Adolphe Sax. Now I’m a farmer and farmers don’t get many holidays but this seemed like a good excuse to get away with the family including Will my son who also plays sax. 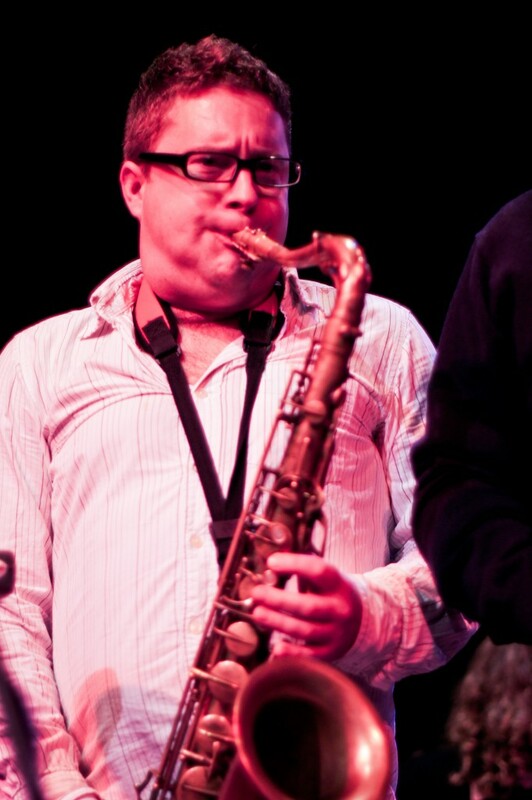 So we were off on our Saxo pilgrimage. With a quick stop off at Bruges on route to get into the mood and get the feel of Belgium, reached Brussels in no time, home of the Musical Instrument Museum. After a night in Hotel Bloom we headed off to the museum full of anticipation and excitement. The museum did not disappoint the whole fourth floor is taken up by the exhibition Sax 200. Just to be in the presence of some of the great man’s musical inventions was incredible. 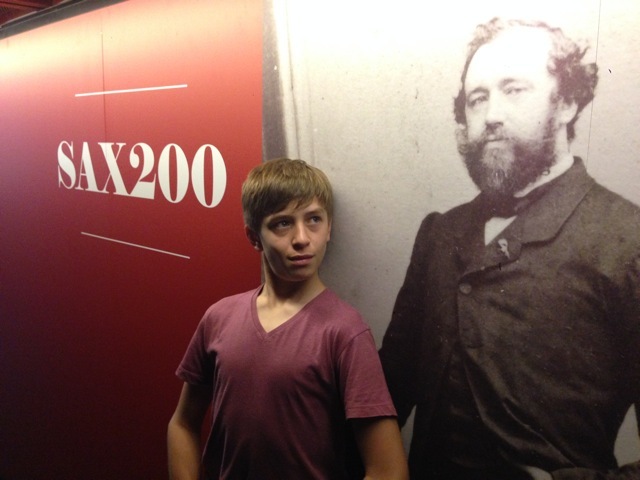 There was an air of calm in the museum giving you time to take in the instruments on display and to feel the genius of Adolphe Sax. The instruments are displayed in huge glass cabinets. I love playing vintage horns I love the sound of them and some of the unknown history behind them so it was very frustrating to have to stand -looking like a kid outside a toy shop- staring through a glass panel. What would they be like to play, to touch, to listen to? You can only imagine. I spent quite some time imagining as well. A look around the rest of the museum made you realise just how important music has been to the human race for centuries. 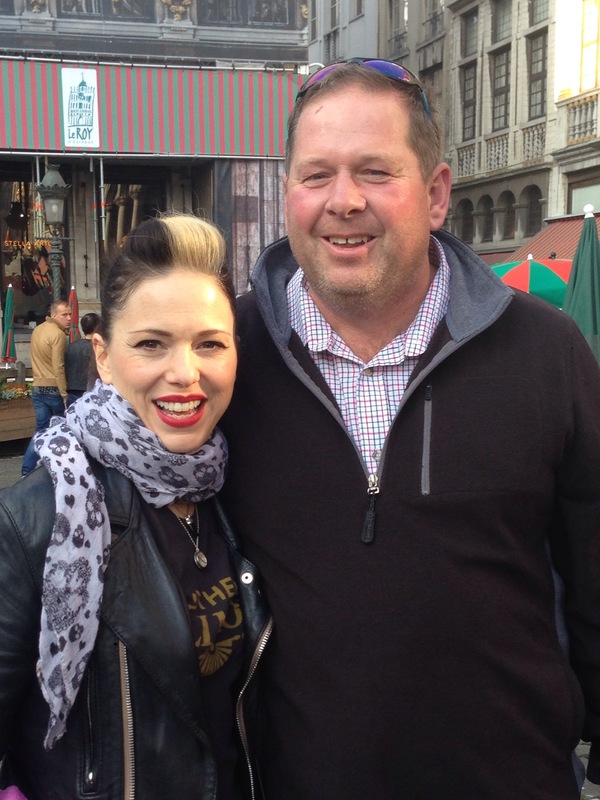 We left the museum and I was on this wonderful saxophone cloud and we went down to the Grand Market Square where we bumped into singer Imelda May. A lady who-to pinch Meat Loaf’s lyrics-has a voice like a horny angel. We play some of Imelda’s songs in our band and I have also been to see her live, she also used to sing in the great swing band Blue Harlem. 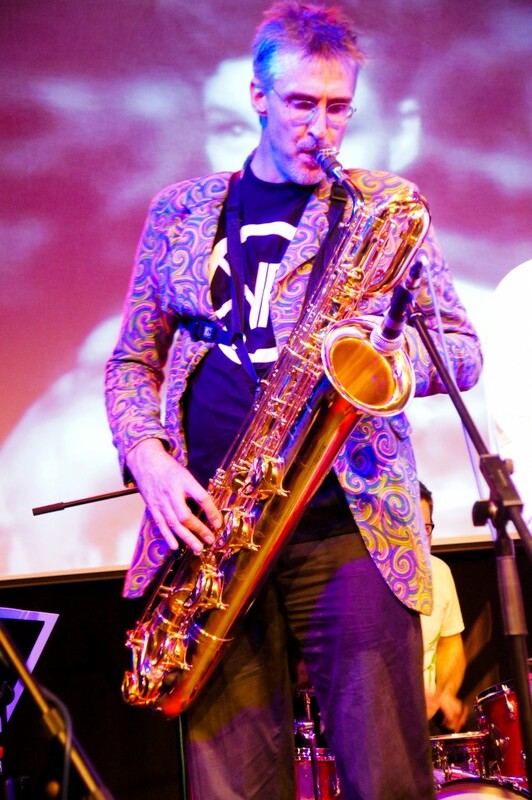 By this time I was an emotional wreck having been in the presence of Adolphe Sax and Imelda May in one day. Time for a lie down! The next day our musical pilgrimage continued to Dinant birthplace of Adolphe. Just over an hours drive through the beautiful countryside of Belgium. 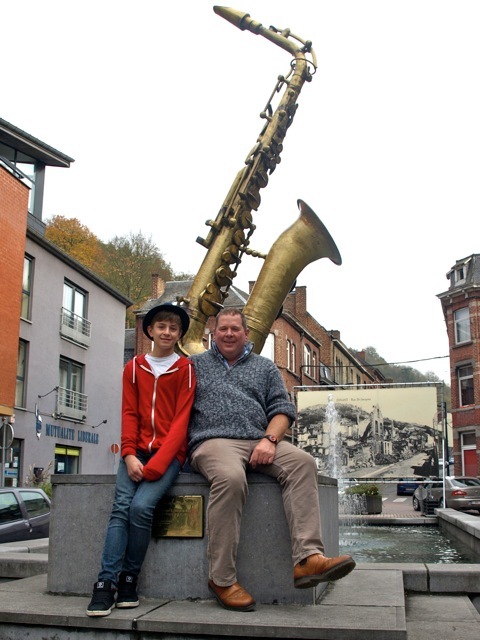 As far as the saxophone goes Dinant has more of a novelty feel to it, more of a celebration than an exhibition. Giant saxophones on the bridge over the River Muese painted by different nations, a crystal sax, a bench outside the house Adolphe was born in and an even bigger saxophone by a water fall. 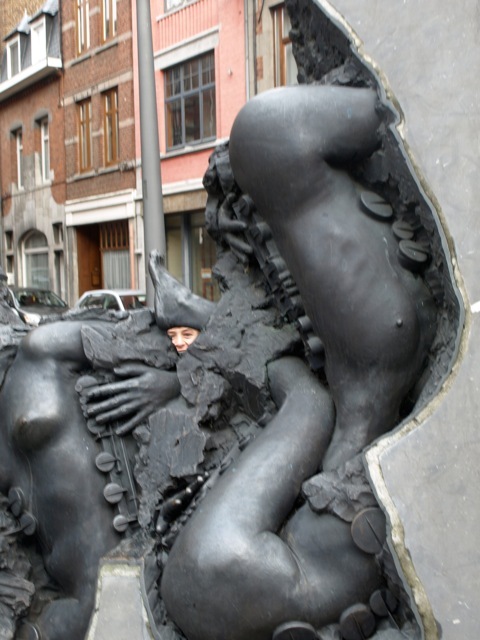 There was also an interesting piece of art showing women giving birth to saxophones. There was also a sad side to Dinant with the outbreak of world War one 100 years ago it was the scene of huge destruction and death. 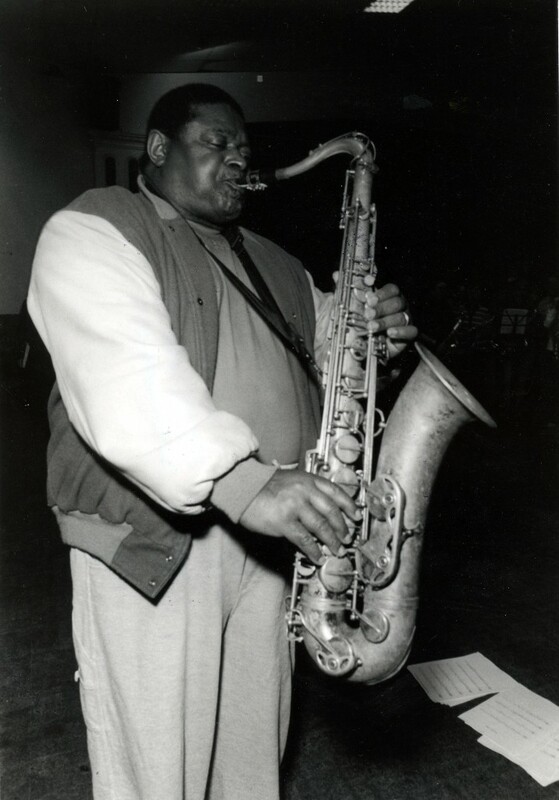 It was during the war when the Afro Americans came over to fight taking horns back with them to the areas like New Orleans to use in their music that would become jazz. 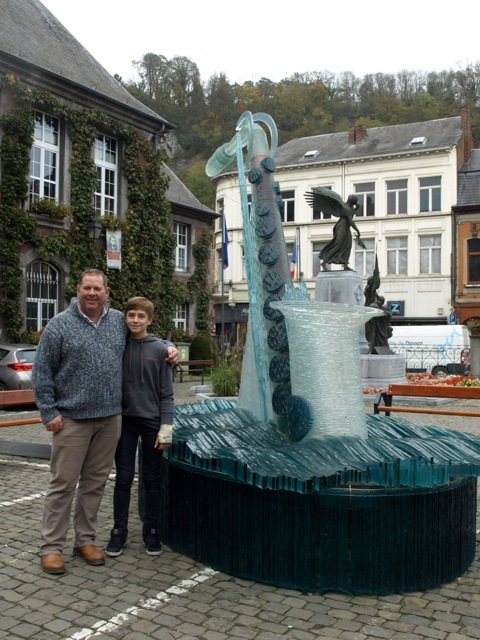 It was in Dinant where we managed to catch up with Thierry Spierkel- designer and maker of the giant chocolate saxophone that Mark Archer played around in Olympia. 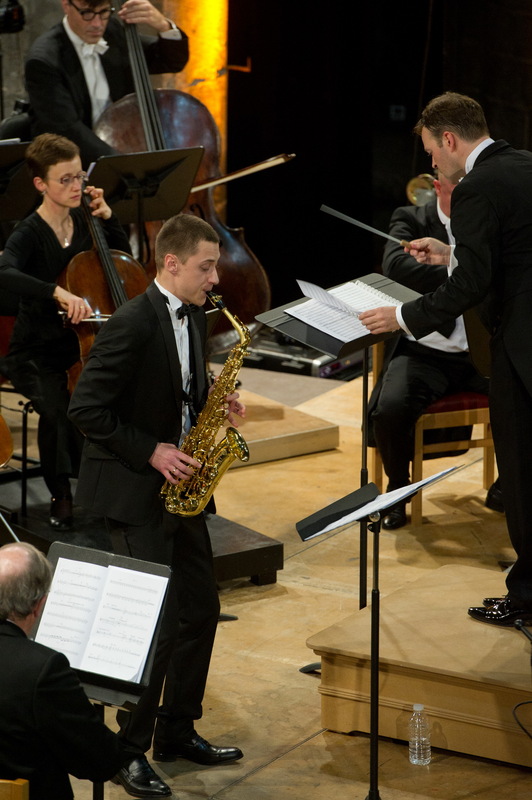 He gave us a great insight into the history of Adolphe Sax and Dinant. We continued our journey to Paris and then back home. 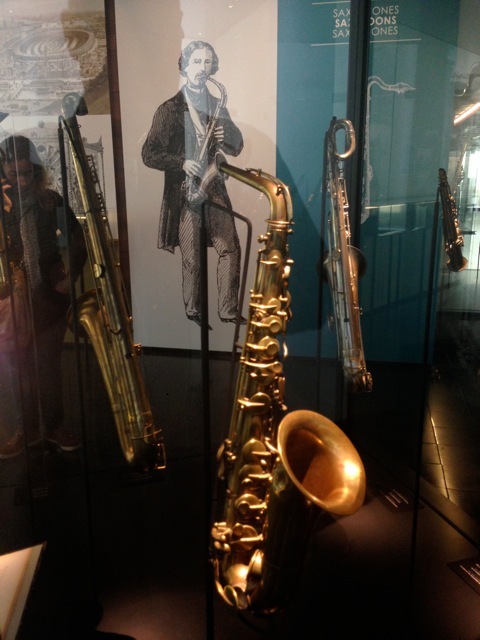 If you are a saxophone fan I would highly recommend a trip to both the Musical Instrument Museum and Dinant just to get a feel for the birth of the instrument. The saddest thing of all is the man that designed the world’s most iconic beautiful sounding instruments died a sad and poor man never aware of the impact his invention would have on the world. 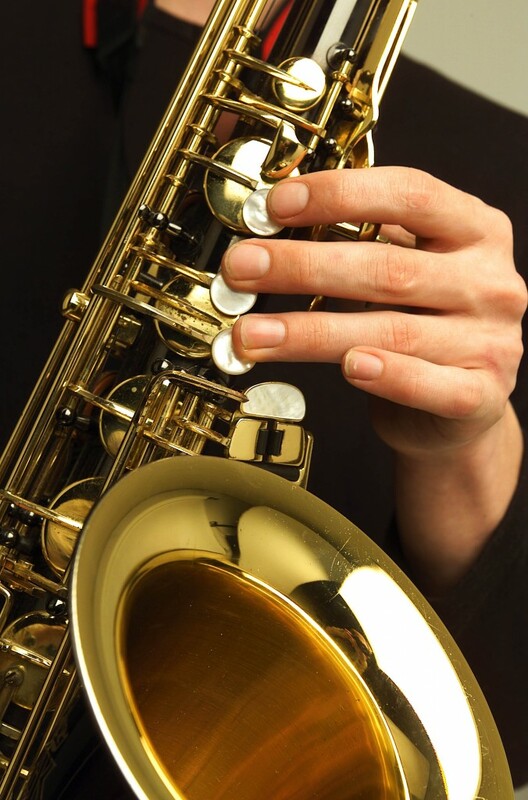 Thank you Adolphe Sax for a wonderful instrument. 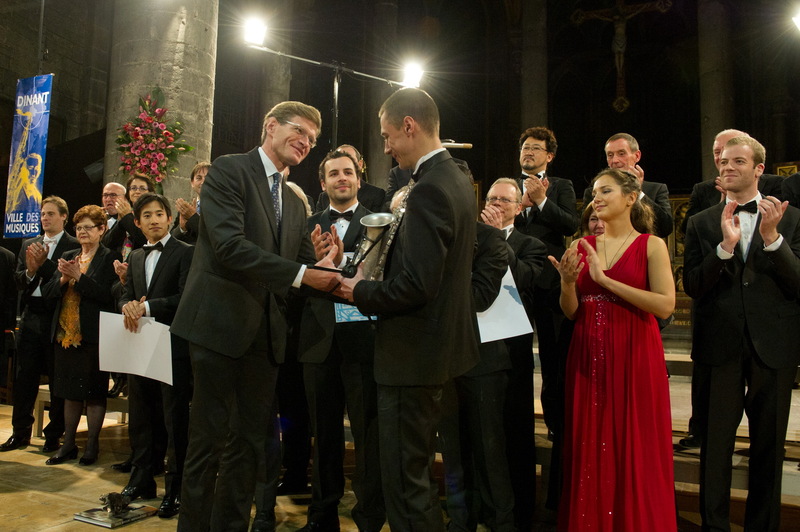 International Adolphe Sax Competiton Results(Résultats de la Finale du 6e Concours) 2014-about as far away from Blowout as you can get!! Good vibe again at the gig last night. Thanks for organising – we all appreciate it. The tempo made all the difference. 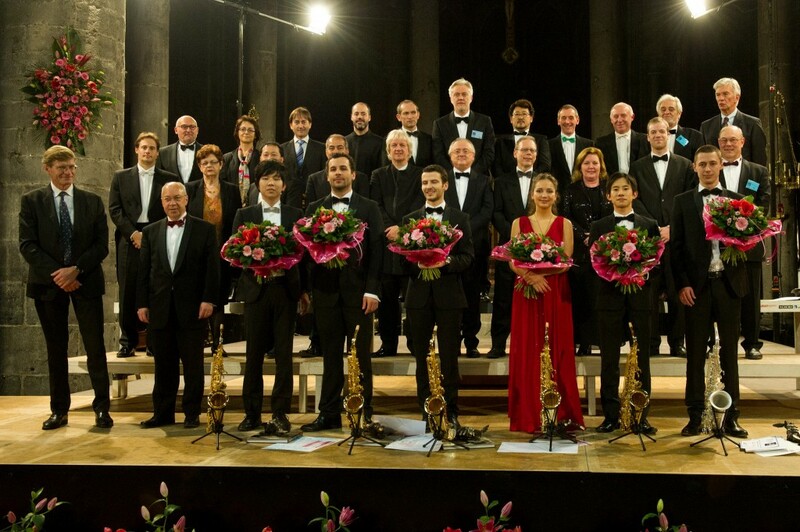 Have to say your vocal is excellent on it too, really adds confidence to the performance. My aims post session with Craig were alternate major with minor blues key, time and agriculture it right to hit the key change, use bis key, hit altissimo note. Great fun. A huge thank you Sir. Hi Mark thank you for a great gig last night Celia and I really enjoyed it.